I am slowly changing my food plans and the way I prepare food to a more defined healthier way of life. It is a work in progress for me because I go back to my old unhealthy habits often. I was researching on the internet one day and came across this recipe. What attracted me to the recipe was the cauliflower. I am a huge fan of cauliflower but I run out of ideas to cook the cauliflower. Most of the time, I just steam the vegetables or roast the cauliflower with garlic. I made this recipe adjusting the recipe using oatmeal as the bread crumbs. I cannot take complete credit for this recipe, but I do not remember where I saw this. The dish is absolutely divine. In a large sauté pan, heat up the olive oil over medium heat. Single layer the cauliflower in the pan and the cauliflower does not overlap. Resist the temptation to stir the cauliflower. The cauliflower will brown in the pan and develop a caramel color after ten minutes, give or take. Stir the cauliflower to try and brown the other side. Add the chopped Kalamata olives and stir until heated well. The salty brine from the olives will flavor the cauliflower. In a food processor, add the oatmeal and grind to like bread crumbs. Add the oatmeal to the cauliflower mixture. The oatmeal will absorb the extra oil and brine from the olives and toast in the pan. Sprinkle with the freshly chopped parsley and serve as a side dish or by itself with a nice green salad. Most excellent! This recipe is good side dish with chicken or fish. For a more intense flavor, add 2 tablespoons of toasted pine nuts, 1 tablespoon of roughly chopped drained capers which will bring a more salty, textured flavor to the dish. I like burgers. I try to eat healthy burgers such as chicken, turkey or vegetarian burgers. But every once in a while the dark side of me pops out and I get the organic beef and make cheeseburgers loaded with tomato, lettuce, cheese, pickles, salt, pepper, mayonnaise and ketchup. I pay for my downfall the next day and I always have to tell myself it was worth listening to my bad side. I was in the mood for a burger today but I decided to listen to my good side and created a healthy burger. I made it with tuna fish. I discovered Yellow Fin Tuna Fish packed in olive oil bought from Trader Joe’s and have determined this is my all time favorite tuna fish. This tuna fish has more flavors in my opinion than albacore tuna. I added different ingredients to the tuna and viola! The results: mega-healthy tuna burger. Enjoy! Open can of yellow fin tuna fish and drain olive oil. Leave a little bit in the tuna fish for flavor. Shred the tuna fish in a small bowl. Chop the olives and green onion and add to the tuna fish. Add the dill, mayonnaise or Greek yogurt, bread crumbs and egg white. Mix until all ingredients are combined. This makes about 3 to 4 patties. 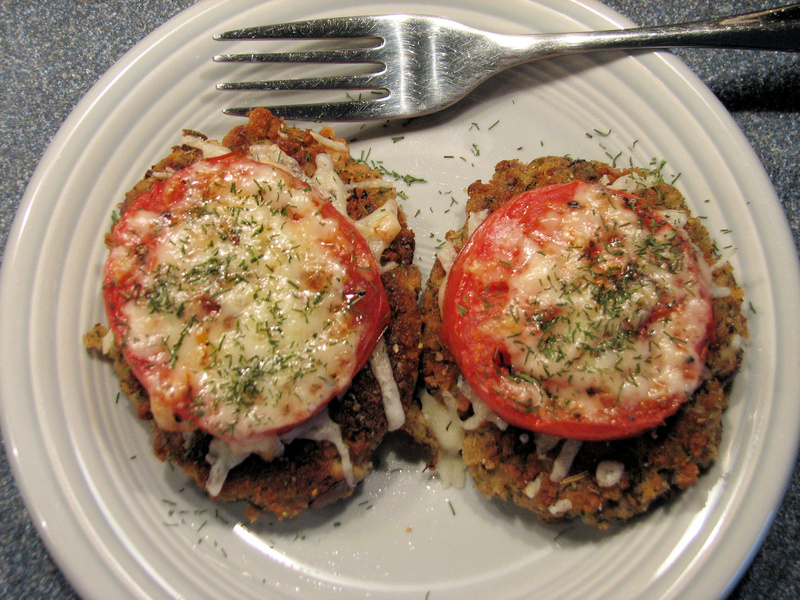 Put the rest of the bread crumbs on a small plate and lightly coat the tuna patties, both sides. In an 8” or 10” frying pan, heat 1 tablespoon of olive oil over medium high heat. Put the tuna burgers in the pan and cook for about 5 minutes on each side until heated thoroughly and the egg white is safely cooked. On a plate, place the tuna burger, add the creamy dill sauce. Click here for recipe link. Top tuna burger with broiled tomato. Serve with salad or your favorite steam vegetables.